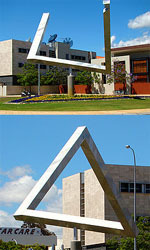 The Impossible Triangle sculpture is a unique landmark built in Claisebrook Square in East Perth, Australia. It is a unique sculpture in that it takes the shape of what is called a Penrose triangle or a Penrose tribar. This type of triangle is known as an impossible object; an optical illusion that projects a three dimensional object that may be interpreted as such visually by the human eye but actually may not be possible of such an object ever existing. The Impossible Triangle sculpture, from a certain standpoint actually looks like an actual three dimensional impossible object. On its actual construction, the Impossible Triangle does not look anything like a triangle. It is actually built like a figure C lying on its side and with its two corners or prongs bent in an unusual way opposite of each other. From a certain standpoint or position, the two prongs seem to meet up with each other, creating a perspective of an impossible triangle. The Impossible Triangle may appear to be a solid object when one stands at a certain location when viewing the sculpture. At other points, one can only see three straight beams bent in an unusually way. The sculpture is made up of polished aluminum. The light that reflects from the sculpture further adds to its appeal as it changes dramatically from sunrise to sunset. This unique sculpture stands at a height of 13.5 meters. It was made as a result of a competition in 1997 when local artists were invited to send in design submissions for a major commission for the East Perth redevelopment. The submissions were trimmed down to three until a winning design of the Penrose triangle was chosen. The sculpture was the brainchild of artist Brian McKay and architect Ahmad Abas.